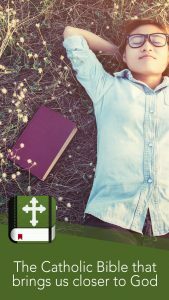 If you want to read and study the complete version of the Holy Bible used by Catholics you can download this app with a free version of the Catholic Public Domain Bible. CPDV is a Catholic Bible comprising the canon recognized by the Catholic Church: 73 books. Catholics Old testaments include the 1st and 2nd Maccabees, Baruch, Tobit, Judith, The Wisdom of Solomon, Sirach (Ecclesiasticus), additions to Esther, and the stories of Susanna and Bel and the Dragon which are included in Daniel. Now you can enjoy free on your phone a complete version for Catholics! Free and easy to use, you can read this Bible app even without internet connection! Download, read and study it every day!